Week in review – politics and policy edition | Climate Etc. Ecomodernism Manifesto [link] This is very provocative, well worth reading. Getting lots of discussion in blogosphere and twitosphere. In #climate policy, emissions cuts are overrated, says #India’s PM Modi [link] Modi is emerging as one of the most interesting/important people on world stage in climate debate. JC note: Because of my heavy travel last week, I probably missed a lot on twitter, so I look forward to hearing about anything interesting that you have spotted. That said, I like having a smaller list of articles, easier for me to vet them. There are some really interesting articles this week, enjoy. Submissions close Friday 24 April 2015. I am preparing a submission. I’ll post my draft in several comments below. I’d greatly appreciate constructive critique to help improve it. There is no point advocating that Australia should not commit to targets; that is clearly not politically acceptable and it would be a waste of time making a submission on that basis – it would be ignored. If the submission is to have any chance of being considered seriously and hopefully having some influence on the policy Australia takes to the Paris Climate Conference in December 2015, it will have to constructively address the three items stated in the Issues Paper. Australia’s post-2020 GHG emissions targets should be linked to the availability of cost-competitive, productivity-enhancing, economically-beneficial, low-emissions technologies. The USA and EU could enable this to happen. All countries, including the USA and EU, would benefit if the USA and EU removed the impediments they have imposed that are blocking progress. Policies that will reduce the cost of energy and reduce emissions are achievable. However, the USA needs to lead the way. US politics and policies have inflated the cost and retarded development of most important and relevant low-emissions energy technologies. EU is nearly as responsible as the US, but is far less capable of fixing the problem. The USA has the ability to solve the global GHG emissions problem. Only slow progress can be achieved by small and mid-size economies, like Australia, and developing countries until the USA and EU unblock progress. •	What should Australia’s post-2020 target be and how should it be expressed? In responding to this question you could consider the base year (e.g. 1990/2000/2005), the end year (e.g. 2025/2030), the type of target and why the suggested target is preferred. •	What would the impact of that target be on Australia? In responding to this question you could, for example, consider the impact on our economy, jobs, business and on the environment. •	Which further policies complementary to the Australian Government’s direct action approach should be considered to achieve Australia’s post-2020 target and why? Submissions close 3pm AEST on Friday 24 April 2015. A strong and effective global agreement, that addresses carbon leakage and delivers environmental benefit, is in Australia’s national interest. If the agreement will not deliver measureable benefits and prevent or compensate fairly for carbon leakage it will fail. Therefore, Australia should not endorse it unless Australia is convinced the agreement meets these essential requirements. 11 October 1990 – The Australian Government adopted an Interim Planning Target to stabilise greenhouse gas emission at 1988 levels by 2000 and to reduce emissions by 20 per cent by the year 2005 based on 1988 levels (known as the Toronto target). An important caveat was included in this target. This stated that measures which would have net adverse economic impacts nationally or on Australia’s trade competitiveness would not be implemented in the absence of similar action by major greenhouse gas producing nations. Actions would be taken if benefits were realised in addition to the greenhouse gas emission reduction benefits, for example energy conservation. This became known as the ‘no regrets’ strategy. •	The definition of ‘dangerous’ climate change is ambiguous, and hypothesized catastrophic tipping points are regarded as very or extremely unlikely in the 21st century. •	Efforts to link dangerous impacts of extreme weather events to human-caused warming are misleading and unsupported by evidence. •	It has been estimated that the U.S. INDC of 28% emissions reduction will prevent 0.03OC in warming by 2100. •	We should expand the frameworks for thinking about climate policy and provide policy makers with a wider choice of options in addressing the risks from climate change. •	Pragmatic solutions based on efforts to accelerate energy innovation, build resilience to extreme weather, and pursue no regrets pollution reduction measures have justifications independent of their benefits for climate mitigation and adaptation. India’s policy may provide a pragmatic approach the world could adapt and adopt. 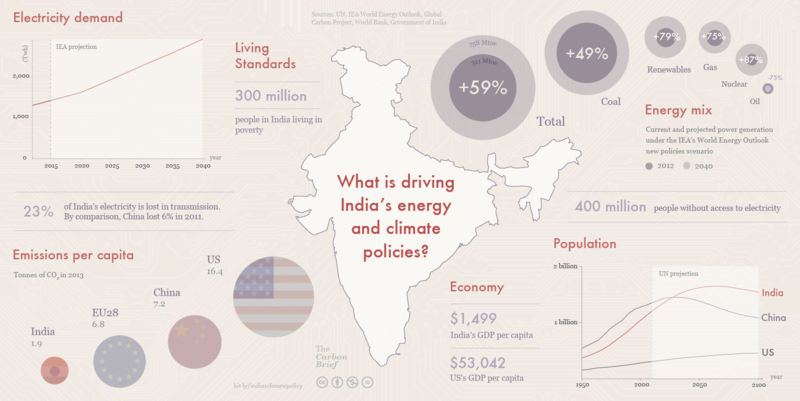 What is driving India’s energy and climate policies? India, the world’s third-biggest polluter, is considering a sharper cut in emissions if rich nations cough up money and technology. India’s policy, with adaptions, may be appropriate for all countries to follow. I argue below it can be done in such a way that all countries would be winners. Australia should incorporate parts of India’s policy and adapt it for Australia. I suggest Australia should follow India’s example and tie its commitments to the availability of cost competitive, low-emissions technologies – technologies that the USA and EU could unleash if they removed the blocks that are retarding progress. 1. Australia commit to participate in a legally binding and verifiable international agreement that prevents or compensates fairly for carbon leakage and ensures that Australia’s industries and jobs will not be disadvantaged by the agreement. 2. Emissions reductions must be economically beneficial for Australia’s economy, jobs and business. This can be done, but the US and EU need to remove the impediments that are retarding progress. 3. Australia’s targets shall depend on the cost competitiveness of technologies essential to reducing GHG emissions – e.g. small modular nuclear power plants. 4. Remove legislated and regulatory distortions to the energy markets, e.g. the renewable energy target, carbon pricing and all regulatory and other impediments to access to low-cost, low-emissions energy (such as nuclear power). 5. Allow Direct Action to do what it is designed to do; remove all other government interventions in the energy markets. 6. Australia should follow China’s example and commit to reducing energy intensity (relative to GDP and per capita). However the target should be expressed as rate of reduction dependent on the cost-competitiveness and availability of low emissions technologies to substitute for fossil fuel electricity generation and (eventually) for transport fuels. In effect, Australia’s emissions reduction rate target shall be a function of the rate at which USA and EU remove the impediments that are slowing progress and allow these technologies to become available and economically advantageous to the world. Small (300 MW or less), modular nuclear power plants are unsafe and more costly to build and operate than the large-scale units of 1200 MW or greater. Therefore, your point 3 is a non-starter since it depends on “cost competitiveness” of the small modular reactor plants (SMR). Supposedly, the benefits for SMR are shorter construction times, less inflation, less interest on loans, all of which lead to lower costs. But, loss of economy of scale overwhelms such benefits. Consider 1200 MWe vs 600, 400, 300, and note that US Dept of Energy defines Small Modular Reactors as 300 MW or less. Each of the smaller size plants must be delivered much more quickly to achieve any savings in materials inflation and interest on construction loans. A shorter construction period very likely cannot be done due to fabrication and delivery of large items: the reactor, steam generators, turbines, and pumps. As amply stated on another thread, nuclear power (as Lang proposes) is NOT low-cost, nor safe. To have nuclear power as a substantial fraction of a nation’s power grid requires unconscionably high prices: from 5 to 8 times existing power prices. The reason for such high prices is that very high fixed costs for nuclear plants, US$10 billion or more per 1,000 MW plant, are spread over fewer kWh when nuclear plants must follow the load. Any policy that attempts to increase the cost of energy is unlikely to succeed. Australia’s policy advisers and negotiators should highlight that reducing, not increasing, the cost of energy is a prerequisite for GHG emissions reduction policy to succeed and be politically sustainable. Box 1 shows that carbon pricing would damage the global economy for all this century and beyond. The message is broadly applicable to any policies that would raise the cost of energy and damage countries’ economies. Therefore, for a proposed policy to have an acceptable probability of success and be sustainable for decades it needs to reduce, not increase, the cost of energy. Policies that will reduce the cost of energy and reduce emissions are achievable. However, the USA and EU need to lead the way. They hold the keys. They can continue to delay progress as they have been doing, unwittingly, for the past 50 years or so, or they can lead the way to remove the impediments that are delaying and slowing progress. US and EU politics and policies have inflated the cost and slowed the development of the most important and relevant low-emissions energy technologies. EU is as responsible as the US for the impediments to progress, but is far less capable of fixing the problem. The US President has the greatest ability to influence the US and the EU to unlock the solutions to solve the global GHG emissions problem. The US President wants the world to reduce GHG emissions and is using the US President’s power and influence to ‘persuade’ other countries to make commitments that would damage their economies. Since the US President wants this, he and future US Administrations should enable it to happen in a way that doesn’t damage the global economy. The US would also benefit from the productivity increases that reducing the cost of energy would deliver. One example of policies that could make a substantial contribution to increasing global productivity, increasing economic growth and reducing global GHG emissions would be to remove the impediments that are delaying the development of small modular nuclear power plants. The US President can encourage and persuade the members of the International Atomic Energy Agency (IAEA) to remove the irrational, unjustifiable impediments that are preventing the world from having low-cost nuclear power. Nuclear power is the safest way to generate electricity. It shouldn’t be restrained on the basis of misinformed concerns about safety. The cost of electricity generated by nuclear power has been inflated by 50-years of irrational, unjustified, legislative and regulatory impediments to low cost nuclear power. Professor Bernard Cohen estimated regulatory ratcheting had increased the cost of nuclear power by a factor of four to 1990. It may have increased the cost another factor of two since 1990 – i.e. a total increase of a factor of eight. Most people want secure and reliable energy supplies at lowest possible cost. If the US President demands smaller economies and poorer countries reduce their GHG emissions, the USA needs to allow innovation and competition to develop the technologies without progress being impeded by legislation and regulations that are grossly inflating the cost. The US is the world leader in nuclear power technology, has the greatest ability to unleash massive innovation, has the most influence on the other influential members of IAEA and is, in effect, the de facto world regulator or nuclear power designs. The USA can lead the world to make it economically viable to reduce global GHG emissions. The USA needs to make this possible instead of trying to inflict slow growth on the rest of the world while impeding economically viable ways to achieve it. All countries, including the USA and EU, would benefit if the USA and EU removed the impediments they have imposed that are slowing progress. Only slow progress can be achieved by small and mid-size economies, like Australia, until the USA and EU unblock progress. Unless polices are net beneficial for all sovereign states in all time periods, they will not succeed. Furthermore, unless ‘command and control’ policies include around 80% of all global GHG emissions, those policies will not survive. A re-plot of the Nordhaus DICE-2013R model’s projected net-benefit of optimum carbon prices for various scenarios using the default input values, is shown in the chart below. The assumptions about participation rate are optimistic (as Nordhaus states) so I have added a scenario for ‘1/2 the Copenhagen participation rate’ (red line). Even this scenario is probably optimistic. See these two links for explanation of the statements in the preceding text and the chart. 1. What should Australia’s post-2020 target be and how should it be expressed? In responding to this question you could consider the base year (e.g. 1990/2000/2005), the end year (e.g. 2025/2030), the type of target and why the suggested target is preferred. 3.	a function of the availability of cost-competitive, productivity-enhancing, economically-beneficial, low-emissions technologies. This is something the USA and the EU could enable. If they did, all countries, including the USA and EU, would benefit from the increased productivity, trade and improvements in human well-being it would deliver. The USA and EU, and only they, can remove the impediments to progress that they have been putting in place, inadvertently, over the past 50 years. 2. What would the impact of that target be on Australia? In responding to this question you could, for example, consider the impact on our economy, jobs, business and on the environment. If the target is stated as a % reduction in emissions intensity that is a function of the availability of productivity-improving, economically beneficial technologies, and the Toronto Target caveat is included, then the policy will be beneficial for Australia’s economy, jobs and business irrespective of assumptions about an intangible, unmeasurable benefit of ‘climate damages avoided’ many generations from now. 3. Which further policies complementary to the Australian Government’s direct action approach should be considered to achieve Australia’s post-2020 target and why? a. Repeal energy related legislation that is damaging our economy, our international competitiveness and our productivity (e.g., RET, FiTs, direct subsidies, legislation and regulations that unjustifiably inhibit coal seam gas projects, and other interventions in the energy market). b. Repeal all Australian legislation that impedes nuclear power being considered as an option for providing Australia’s electricity. 2. Hidden costs of energy supply should be visible and appropriately apportioned to consumers. For example, the owners of solar panels should pay their fair share of the costs of the electricity grid and the many hidden cross subsidies from the reliable generators to them. 3. Furthermore, the cost of electricity and gas distribution networks for suburbs should be fairly apportioned to all properties. Therefore, the “supply charge” should be split between the charge to consumers (applied on the electricity and gas bill) and the charge to all who live in the suburb. The cost of the electricity infrastructure should be included in the rates..
4. Establish faculties in universities and ‘centres of excellence’ to research and teach to support the least cost and fastest way for Australia to meet its GHG emissions targets. 5. Ensure Free trade agreements preclude penalties or trade barriers based on climate policies dictated by UN, Washington, Brussels, Moscow, or Beijing. Peter, maybe you should do a guest post on this instead of posting it all as comments. On my screen you posted over 10 feet of continuous comments. A bit much. I considered asking Judith if I could post it and drafted an email. However, after thinking about it I thought a) it would be too long for a post, b) time is to short until submissions are due, and c) I couldn’t ask her to post the pdf and link to it because if she did do it for me it would be a precedent and many others might ask to have their draft articles posted on CE to get a review. So, I thought I’d give this a try and see what response I got, The silence suggest it is not appreciated. Curry on 97% consensus claims: “The so-called 97% consensus is about fairly trivial things: ‘Yes the temperature is warming; Yes, humans are putting carbon dioxide into the atmosphere and Yes, carbon dioxide does have a greenhouse effect. But that doesn’t tell us whether human caused climate change is dominating over natural climate change and that is where the big debate is about. Thanks for posting this. I continue to be amazed and in some hard to articulate ways, humbled by Judith’s evolution on this issue. I’m no scientist. As I’m fond of saying…because it’s true and somehow freeing….I’m not even very bright. But I see that as good news. Which is to say if a guy like me can get to the core arguments against the global warming “consensus,” I believe most people can. Interesting , in “Opinion – White, Wealthy, and Whiney: An environmental movement in need of a makeover.” I notice the same tired notion that conservatives are “out-of-touch” with minorities or the minority way of life. In the author’s question “Can someone please deal with the white thing?” I was seriously sure he was bringing up the issue of how the environmental movement and anything to do with it is a painfully white movement. But apparently he turned the answer back to how conservatives are so out of touch with minorities, etc, etc… In my South, this is far from the truth. While the “environmental” movement with all its song and dance is almost exclusively controlled (exclusively so) by frumpy and soulless liberal whites, the notion that conservatives here are out of touch with the environment and minorities is just laughable. It is quite often that liberal whites are out of touch with minorities and that they have no organic or authentic connection to minorities in this regard -nothing from what I’ve seen. The white environmental movement here is painfully disconnected from the black communities, and only so in useless (let me restate -Useless) political fashion. And frankly, I have far more conservative environmentally conscience clients than that of liberals. The author states that politics needs to be removed from the discussion, however he falls back into politics by obtusely claiming that white conservatives are to blame. Marie Antoinette sends her regards..
… and a box of cakes, I trust. Green is a mixture of blue and yellow. That is the only factual definition of green that will stand the test of time. After that; any other definition is a corruption of a perfectly nice color. I have been an exterminator for over 30 years. I have served as a trustee on industry association boards representing pesticide and fertilizer applicators actively for over 15 years. I believe that what we do isn’t just a job; it’s a mission! We are that thin gray line that mans the wall telling the world; “no one will harm you on my watch”. I also believe that to be green is to be irrational, misanthropic and morally defective. They are the barbarians at the gate we have to stand against. Our greatest worry is those within who support and facilitate their misanthropic goals. Transitioning to a world powered by zero-carbon energy sources will require energy technologies that are power dense and capable of scaling to many tens of terawatts to power a growing human economy. High-efficiency solar cells produced from earth-abundant materials are an exception and have the potential to provide many tens of terawatts on a few percent of the Earth’s surface. Present-day solar technologies will require substantial innovation to meet this standard and the development of cheap energy storage technologies that are capable of dealing with highly variable energy generation at large scales. Nuclear fission today represents the only present-day zero-carbon technology with the demonstrated ability to meet most, if not all, of the energy demands of a modern economy. However, a variety of social, economic, and institutional challenges make deployment of present-day nuclear technologies at scales necessary to achieve significant climate mitigation unlikely. A new generation of nuclear technologies that are safer and cheaper will likely be necessary for nuclear energy to meet its full potential as a critical climate mitigation technology. In the long run, next-generation solar, advanced nuclear fission, and nuclear fusion represent the most plausible pathways toward the joint goals of climate stabilization and radical decoupling of humans from nature. I notice they left out Space Solar Power, although realistically, it has as good a chance of becoming the predominant energy source as other types of “nuclear fusion”. While the actual collection in space would be competitively low-density, the energy collection on the ground could be as high as 10,000 Watts/m^2 using microwaves, and a MegaWatt/m^2 using lasers. And no fundamental theoretical breakthroughs would be required, although some substantial engineering advances would. Well, the article makes the valid point that current wind and solar technologies are too inefficient and chew up too much land. Which means coal and nuclear until the technologies improve. Space solar power is never going to happen because the only difference between its power transmission and a beam weapon is targeting. Also interesting. “Dutch Citizens Are Taking Their Government To Court Over Climate Change.” They say that not acting illegally endangers its citizens. Another example of a small group of people attempting to hijack policy. Too much of this BS going on in the US too. So you think they should blindly allow the government to do what it wants? The government knows better what is good for its citizens? See it works both ways, and you only object to one way. A vocal but wrong minority group shouldn’t be allowed to set policy for everyone else. How about states and people including border patrol agents suing the government to enforce the immigration laws, jimmy. Is that a good thing? These suits only work if the court agrees based on their laws that the government is not being responsible. So in the end it comes down to laws and responsibilities in every case. Your reply is trivial, jimmy. You didn’t answer the question. I asked if you are OK with people suing to get the government to do things that your handlers at huffpo don’t like, such as enforcing the immigration laws. Your avoidance of the question and your comment history is sufficient for me to make a determination, jimmy. You only like citizens suing the gubmint, when your ox is being gored. That’s all. I am OK with people suing. If they have a trivial case, it will lose anyway. I doubt the Dutch case will go far too. It is just a concern they want to air. We all know how that works. They manipulate the system to get a judge favorable to their minority cause. In the U.S. it’s more of an inside job. jim2, that works both ways too. Look at the Texas judge’s ruling on Obama’s new immigration policy. Jim D: If they have a trivial case, it will lose anyway. Are you unfamiliar with the huge costs engendered by the trivial cases of delta smelt and desert tortoises? Or the documented cases of officials “fudging” and “exaggerating” the evidence of threats? > You didn’t answer the question. Any other policy recommendation than reopening education camps and going nuclear, Don Don? Jim D. A bunch of states that have to pay for Fed boondoggles have a lot more standing that 0.0001% of the population. I have long thought that there were important advantages to adjudicating a lot of CO2-related issues in court. Dutch law will doubtless be shown to be different from American law, but the greatest advantage to fairness and completeness will be the ability of adversaries to cross-examine all witnesses under oath. In that story, it seems that the citizens involved in the suit were unsuccessful at getting the legislature to change the Dutch laws. In California a group of activists spearheaded by the Sierra Club has used the court system to block the construction of all 19 desalination plants planned for the coast (to be powered by waste heat from electric power plants.) They held up construction of the Carlsbad plant (now operating, iirc, at 80% of planned capacity) for years after it had been approved by the authorities charged by law to review such projects. But they did not get the law changed, so the other projects may be approved and completed in due course. The Netherlands is one of the nations that has joined the Asian Infrastructure Investment Bank. It will be interesting to see how the Dutch react when their savings are invested in coal-fired power plants in Asia. Lots of American and European greens seem oblivious to their role in facilitating the growth of the Chinese mostly coal-fired electricity industry. I think emissions cases are harder to link to endangerment than things like the refusal to plan for sea-level rise, and more direct cases could be related to adaptation planning than mitigation. If a state has harm from water shortages that could have been predicted and planned for, but was not for some political reason, suits could be justified there. The key is that local and national governments should be planning for climate change, given what is known already, and not stay in a wait-and-see mode until enough bad things happen. Jim. D. I don’t blame you for grasping at straws. Fortunately you’re losing the war. Governments around the world are beginning to turn away from pointless, self-destructive energy policies. Look for the trend to pick up momentum. Paris is going to be a catastrophe for the warmist crowd. I think it might some day be regarded as a watershed. In this case they want a 40% reduction on1990 levels in emissions by 2020, so their government was not going far enough for them with 16% from 2005 levels by 2020 which is in line with many other EU countries. If they were not going for reductions at all or allowing increases, I think there would be a case, but as it is there isn’t. In an otherwise interesting article, this stood out as rather…shall we say…uninformed. Tell the billions living in Communist china, fascist Russia, socialist India, and most of despotic Africa. “Personal, economic, and political liberties” are the exception, not the rule, in human history. Taking them for granted, as the article does, is the most likely way of losing them. And freedom is not “on the march”, quite the contrary. Otherwise, the article’s call for more nuclear power is unobjectionable, and only new for the left. The call for greater subsequent subsidies for research and “decoupling” are just more of the same old, same old. Although it is nice to see these calls from the left without the fire breathing, anti-capitalist rhetoric that normally accompanies such “manifestos”. They authors are obviously “progressives,” and therefore are incapable of critical reasoning. Only non-elitists such as yourself, in other words some 10%? of the American public, are capable of critical reasoning. Everyone else are only driven by totalitarian goals. So the problem with the article is that to whatever extent the authors wrote anything that you agreed with, it could only have been by chance. Smartest thing you’ve said in a long, long time Josh. Don Don continues to peddle untruths based on hearsay. It is not that progressives are incapable of critical thinking. Chomsky’s deconstructive history is an example of critical thinking about positions with which he disagrees. It is badly distorted and wrong, but it is an example of progressive critical thinking. The problem I have identified, that some just have to lie about, is that progressives are incapable of critical thought – about their own beliefs. It is a product of their training, and an instinctive protective reflex against threats to their cognitive dissonance. Thanks for the clarification, GaryM. I’ll take note. It isn’t that some 90%? of the American public aren’t capable of critical thinking, it’s that they’re incapable of critical thought – about their own beliefs. Willard thinks the Chinese, North Koreans, Russians, Indians, Vietnamese, Cubans, Liberians, Zimbabweans and billions of others are free. Shockingly, no progressive organizations that I know of prepare indexes showing the lack of freedom among countries with progressive governments. > Willard thinks the Chinese, North Koreans, Russians, Indians, Vietnamese, Cubans, Liberians, Zimbabweans and billions of others are free. Thank you for probing my mind, GaryM. If you know what I would like to eat for supper, that would be great. The claim you’re supposed to address is [p]ersonal, economic, and political liberties have spread worldwide and are today largely accepted as universal values, BTW. 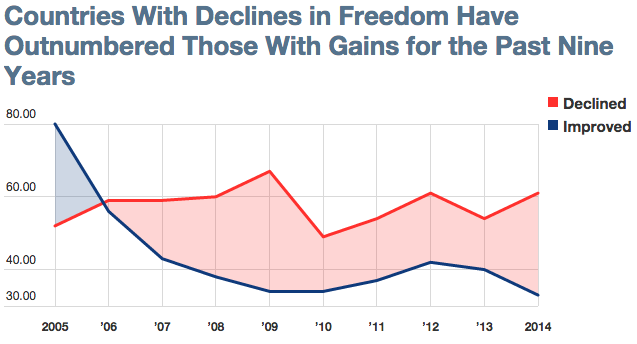 Fishing an unsourced and unexplained graph from the Freedom House where it cherry picks nine years, while being above your usual efforts, is far from making the cut. > Shockingly, no progressive organizations that I know of prepare indexes showing the lack of freedom among countries with progressive governments. That’s why libertarian think tanks exist, GaryM. There is some debate over the neutrality of Freedom House and the methodology used for the Freedom in the World report, which has been written by Raymond D. Gastil and his colleagues. The neutrality and biases of human-rights indices have been discussed in several publications by Kenneth A. Bollen. Bollen wrote that, “no criticisms … have demonstrated a systematic bias in all the ratings. Most of the evidence consists of anecdotal evidence of relatively few cases. Whether there is a systematic or sporadic slant in Gastil’s ratings is an open question” (Bollen, 1986, p. 586). The freedom index of Freedom in the World has a very strong and positive (at least an 80%) correlation with three other democracy-indices studied in Mainwaring (2001, p. 53). 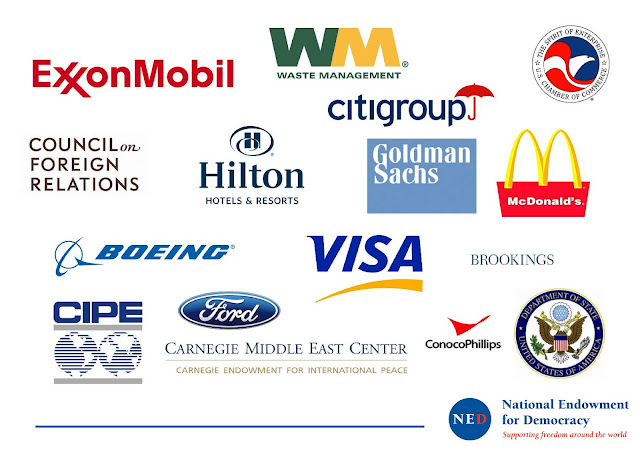 Considering how they systematically aligned with the American foreign policy and corporate interests, how Freedom House manufactures its brand name deserves due diligence. I view the “Manifesto” as being an early rough draft; essentially encompassing perceptions of the authors as they see themselves now, which, also reflects what they can see from their perch. Their perch seems to me to be upon a rock, in a swamp (the children’s parable of the turtle as a ruler of all he could see). Stabilizing climate as they advocate, speaks to a conceit that they know what the correct climate is; that climate stability is a worthy goal, and in particular, that mitigating CO2 somehow is worthy of the effort. I think such propositions still need a little work. There was the observation that global populations are becoming more urban, currently estimated at 50% and expected to be 70% by the end of the 21st Century. With urbanization, fewer people are getting “out into the country” these days in spite advertisements of Jeep Wrangler fording streams and climbing mountains. Children are going to summer basketball, tennis, soccer, music, art, camps and not foraging into the North Woods to fish and canoe and swim and to be cold and be hot and get bitten by mosquitos, to have campfires, make and eat Smores, sleep on a cot or on the ground; all the experiences that one had to connect one’s self to the earth. As for hoeing in the garden, nurturing green beans to grow, building barriers to keep the rabbits from eating your efforts in a night’s time, these experiences, which also help connect us to the earth go missing when there is increased urbanization of a global population. Yes we will make the trip to Yosemite, Yellowstone and Acadia, stand for a while, take our pictures and then go home to concrete sidewalks and decreasing quantities of usable yards. Finally, well, not really finally, the world’s population is getting older, and by the way, more frail. As I see more people with walking sticks to navigate the footpaths, their hair is gray, and they (hmmm I am) slower and more deliberate in my hikes, and I am not holding up the rest of the troupe. The good part of the Manifesto was the advocacy for modern fuels for energy. Urbanization whereby such energy producing plants can serve a greater number with a lesser foot print. The Manifesto needs work to include the range of people who will inhabit the earth and hopefully develop ways to remain connected to Gaia. RiHo08: I view the “Manifesto” as being an early rough draft; I had a similar response. We’ll see what they “really” mean when they write about a lot of specific projects with known, poorly known, or unknown costs and benefits. They wrote of political resistance to nuclear power in the US, for example; would they favor an expensive program in various localities to overcome resistance? Why or Why not? They mention nuclear fusion power: which of the current technologies are worth investment, and at what annual rate, compared to flood control and irrigation structures? The ecomodern manifesto asserts that intensification will enable less environmental impact. It argues agriculture (yields). For two of the four grains, wheat and rice, this was accomplished by dwarfing. That cannot be done twice. Wheat yields plateaued globally a decade ago. Rice yields in best practice countries like China and Japan have plateaued. IR8 dwarf rice isn’t adopted elsewhere because the farmers don’t have access to requisite synthetic fertilizer and herbicides. Reforestation is partly enabled by the substitution of fossil fuels for firewood. Where that is not the case, deforestation continues. Haiti and Ethiopia are poster children. So the manifesto is idealistic, somewhat impractically uncoupled from reality. And to the extent intensification is a general ‘solution’, then renewable electricity is distinctly going in the wrong direction. See Joel Kotkin’s “The New Class Conflict”. He argues that densification and urbanization work against expanded opportunity for the middle class and promote income inequality. Agreed, but a huge amount of farming worldwide is being done without modern capabilities. The expansion of existing methods into the rest of the world itself will result in much greater production. This dynamic, for example, is far less prevalent than in areas like oil production or manufacturing – in no small part due to the much more distributed nature of agriculture. Thanks for spotting that valuable resource. I would still like an answer to my earlier question regarding your comments following your interviews by Rick Santelli and Mark Levin. “Note, on Wed I appeared on the Mark Levin show (doesn’t get more conservative than this). I found a link to the Levin interview, and my question is the same for him that I asked about Santelli earlier. They gave you a forum to state your views. (As have Republican congressmen, and only Republicans as far as I know.) As I listened to both interviews, I found no instance where you tried to correct any “clueless” position, In fact, I didn’t hear any area of disagreement between you and the assumptions behind the questions they posited. Levin in particular included a strong defense of you against Grijalva after your interview concluded. Pretend this is one of the guest authors you invite to post here on your blog, and one of them later notes how clueless you are on their subject. Wouldn’t you be interested in knowing what they were clueless about? These are political commentators, engaging in the debate you seem to think is lacking, on the political nature of the “climate change” debate. A debate which you yourself also characterize as political. I listened to the Levin interview, and I can see what Judith was talking about. Some of his questions were clearly distortions of things he had heard second hand rather than from any research of his own, and Judith could only guess what the question really was based on and answer that instead. She also had to do this with Congress members who were making either highly simplified or erroneous statements based on hearsay. It is an art to do this without appearing to be correcting the person. The question I asked for was “quotes”. If you can’t find any, fine, but how about a quote from either article. Which questions were “clearly distortions”? And how many of your questions and comments here are from your own research? What research have you done on radiative physics, ocean heat retention, paleo-climate analysis, etc., if that is the pre-requisite for voicing an opinion. Virtually everybody here knows what they know because the heard/read it from someone else. That’s one of those criticisms that sounds insightful when you write it, but when you actually think about it…not so much. Listen to the interview. I remember he said asked something about what happens with no CO2, for example. I am not going to listen to it again, but I had the same impression as Judith of a very shallow, if any, knowledge of the actual scientific questions there. He talked about emails, of course, and how Congress should not intrude that way, and started to say something about Hilary but backed off when we he realized this wasn’t helping his case. Before and after the interview he was more in his own comfort zone of accusing Obama of a Soviet-style government. His question was simple, we need CO2 don’t we. We can’t live without it. The United States Supreme Court in its infinite wisdom decided that CO2 as a matter of law is a pollutant. Levin’s question is part of the political/legal aspects of the climate debate. Levin’s position is the common sense one that that which is necessary for life is not by definition a pollutant. For example, water can and does kill directly all the time, floods, drowning, spread of disease. If you drink too much water, you will die because of the dilution of your electrolytes. But none of that makes water a pollutant. Levin’s question and your reaction to it may show that someone is clueless about some aspects of the climate debate, but it is not Levin. GaryM, if you can find any question he had on the science that looked like he knew what he was talking about, you can show it. My impression was that there were no deep questions there at all. What happens with zero CO2 is not the issue of the debate at the moment. Some questions were tough for her, because she even had to defend aspects of the consensus to answer them. Garrie thinks this displays Levin’s wisdom on climate science, mostly because Levin is a lawyer and he is really smart. He is really smart, but this is just a goofey denier talking point that Levin probably got from listening to Rush Limbaugh. The alarmists are not trying to eliminate CO2. Bringing up the fact that we need CO2 is irrelevant and trivial. Has nothing at all to do with the issue. That garrie doesn’t see this tells us all we need to know about garrie’s competence to judge whether someone is clueless on climate science. Case closed. > Stop making a fool of yourself, garrie. Thank you for showing Denizens how to substantively address anything, Don Don. How do you call such technique, again? I did a quick search for “Monfort |” and “joshie” over a couple of threads recently. Don made some 56 comments and “joshie” appeared 31 times. Even disregarding the vapid content of most Joshua posts, Joshua is still the king of trolls. Willard, however, is making a strong push at 1080 results. True, the listing is merely a historical record as opposed to an ongoing breakdown. returns 2040 results. Or in other words, Joshua spends an only somewhat smaller fraction of time on your web site as you do. If I cared to spend more time, I’d scrape all the comments and put up more detailed data, but even this rough approximation shows something of distinction. Fortunately, despite having made similar promises many times, Don never follows through. Imagine how much less amusing Climate Etc. would be if Don were accountable for what he says he’s going to do. How do I get on Don Monfort’s ignore list? And garrie? Really? I know it is hard to add a ‘y’ to Gary to make it a diminutive like you do the other objects of your affection, but if you want to be condescending to others, you have to show at least some limited capacity for wit. So far you have only managed a half measure. Where are the Judith quotes, garrie? Quotes of Judith’s reflexive demeaning, garrie? Make your case against Judith, alleged counselor. Put up or shut up, garrie. “clueless” is demeaning. For one example. Particularly when directed at those gracious enough to use their programs to give you a platform to air your own views. She was for years dismissive of “Rush Limbaugh listeners” and Republicans in congress. And then those Republicans began calling her as a witness. Over time, Dr. Curry became a lot more circumspect in her offhand references to conservatives, but I see the tendency coming to the fore again. Frankly, I think her comments about Santelli and Levin were clueless, and more than a little rude. But political debate is raucous, even sometimes coming from the more genteel like Dr. Curry. So she is definitely within her rights to say what she wants, particularly on her own blog. But if she is going to allow open comments, and endures the incessant ankle biting of others, surely it is not too much of an imposition if I point out this tendency on this one issue. You came up with exactly one quote that is verifiable, because we have seen it recently. However, you have not provided the actual quote, including the context. And you have not attempted to establish that Judith is demeaning anybody. If Levin was dragged into court and quizzed on climate science, it would become evident very quickly that he is “clueless” on that subject. Therefore, a climate scientist making the observation that Levin in clueless on the climate science is not demeaning. Got any quotes to back up the accusations on these thingys. garrie? And please remember, garrie, that you putting word or words in quotes is not what we are looking for. You have to actually show the person said what you are claiming. Source? Do you need a recess? Sorry, you can try to use diminutives of names, accuse others of trolling, and stalking, and ask interminable questions, all without ever offering any substantive comments yourself. Dr. Curry allows it and it is her blog. But I don’t have to waste my time responding to you, and I won’t, any more. My comments and questions were to Dr. Curry. If she wants to ignore, them, that is her right, it is her blog. If she wants to dispute them, ditto. If she wants to ask me for more examples, fine. But you do not interest me, at all. So given your uniform lack of actual content, I will now do you the favor of actually ignoring you, not fake ignoring which is your practice. You are making accusations against Judith without backing them up. Very progressive of you, garrie. Running away when you are challenged using lame excuses about diminutives and ignoring and all that crap also looks very squishy and leftish. We don’t expect such unheroic behavior from bedrock conservatives. Mark Levin would be ashamed of you, if he cared at all about anonymous little blog characters making unsupported accusations about the blog’s gracious hostess. Gary M: “clueless” is demeaning. fwiw, usually not much, I take your point. Without substantive exact quotes, it’s a baseless insult. ==> “So given your uniform lack of actual content, I will now do you the favor of actually ignoring you, not fake ignoring which is your practice. I will give Gary some credit: After a few times stating an intention to ignore me and failing (you know, with the “I’ll make this one exception” or “you made me make an exception” excuses), and after a number of amusing pleas to other “denizens” to not respond to me, he did eventually live up to his claim to not respond to my posts by directing comments to me directly (now he only seeks the opportunity to respond to them them by addressing comments to other people). This is notably unlike Don – who I suspect will continue to make the claim to ignore me and laughably think that anyone thinks that he can or will actually follow through with it. Although perhaps Don, also, will eventually take up the practice of responding to me by not responding to me but by responding to other people about the comments I’ve made. Matt, a scientist commenting on the level of knowledge of someone who has recently interviewed her on the subject that is in her wheelhouse is not a baseless accusation. Maybe she should have said uninformed, instead of clueless, but it’s the same thing. Humans need CO2 to live. Does that indicate the person is informed on the issue of anthropogenic global warming? Baseless accusation? Garrie won’t provide quotes. Sorry – I know that you’re looking for the answer, GaryM, and I wouldn’t want you to miss it because I put it in the wrong thread. In a short 10 minute live recorded interview, there is not much you can accomplish. The best you can do is try to connect in some way with the interviewer to give relatively brief but factual answers in a manner that is hopefully understood by the host and their audiences. curryja: In a short 10 minute live recorded interview, there is not much you can accomplish. Some sympathy for the hosts then? Santelli did some homework for the interview, Levin doesn’t seem to have. I’m not criticizing either for how they do their job, but I felt both were pretty clueless (esp Levin) about many of the relevant issues surrounding climate change. It was their choice to try to do something significant in 10 min time slot. I will suggest to you that on the political debate, which is what the CAGW/decarbonization debate is really all about , Levin does not need to do any homework. That political debate was going on long before you were a lukewarmer, and nothing has really changed in that debate. He didn’t invite you to be a guest because of your knowledge of radiative physics, GCMs, paleo-climate, etc. He invited you because of your position that the claims of uncertainty by the consensus are not scientific, but political. You only recently came to the conclusion that the IPCC is hopelessly politicized, and should be disbanded. Conservatives have known that since at least before the AR3. I ask for examples of cluelessness in those short interviews, and you respond with your feelings about how knowledgeable you think the interviewers were. So be it. We are talking climate science, so I guess feelings will have to do. I googled ‘mark levin climate change’, didn’t find much, but what I found did find was not inspiring to say the least. Lest you think that I am trashing all conservative talk radio hosts on this, I will say that Rush Limbaugh has learned a lot over the past few years and is now making defensible arguments. I will suggest to you that on the political debate, which is what the CAGW/decarbonization debate is really all about , Levin does not need to do any homework. That political debate was going on long before you were a lukewarmer, and nothing has really changed in that debate. >b>He didn’t invite you to be a guest because of your knowledge of radiative physics, GCMs, paleo-climate, etc. He invited you because of your position that the claims of uncertainty by the consensus are not scientific, but political. This comment seems to sufggest you think Judith is naive and doesn’t know what she’s doing. I suggest, instead of pointing out to Judith what you think the journalists’ agenda is, you would be more helpful if you explained for the benefits of CE readers, who have less understanding than you of the roles of the various players in the political process, what the interviewee’s role is and their reason for being interviewed. I suspect the reason interviewees agree to do interviews is not necessarily to educate the interviewer (that would be a nice additional benefit, but occurs rarely) but rather to pass information on to the listeners, educate them, give them a perspective they may not get from others. I think Judith does brilliantly every time she fronts the media, and it doesn’t matter if the interviewer learns anything or not. The interviewer and the interview do not have the same agenda (mostly). I am enormously grateful for what Judith has achieved already with CE, interviews, presentations to politicians and political oriented advocacy groups (like AGS). I thins we should all be enormously grateful. Judith is saving the plantet. She is close to God! The alleged justification for the decarbonization is the CAGW. The CAGW is a science issue. If you don’t have a clue about the science you can not intelligently argue for, or against decarbonization. Pointing out that CO2 is necessary for plant/human life is not an argument. It is a denier talking point. It’s silly and irrelevant. Lead, mercury. black soot and a lot of other things are not by definition pollutants. They become pollutants when they get into the environment in sufficient quantities to cause harm. Right now we are stuck with the EPA’s decision that CO2 is a pollutant. That is not going to be changed with the silly argument that CO2 is necessary for life. The EPA will say we are not taking away your CO2, silly. You are doing fine with 400 ppm. Why don’t you let Judith argue the science and you argue from the common sense angle? You can’t do any harm. Levin also had gems like, if you can’t predict 7 days ahead, how can you say what is happening in 70 years? How is Judith supposed to answer that in a 10-minute show in a way he can understand, while distinguishing climate from weather. This is one area that she had to start by making the alarmist view for them before criticizing it. Another question was simply, warmer is better, right? Again Judith had to give both sides. Other confusions also came from conflating weather events and climate change, where you have to give the context before answering. A very inefficient unfocused interview, and I am sure Judith did not enjoy having to give both sides as answers. The alleged justification for the decarbonization is the CAGW. The CAGW is a science issue. If you don’t have a clue about the science you can not intelligently argue for, or against decarbonization. Gee. Science issue you say. What is the empirically measured ECS (to within +/-10%)? Science must know, since they have had almost 30 years and this is the linchpin of the debate. Until recently there was just sound of crickets on the core issue. Please explain that, if this indeed is a science issue. If the ECS isn’t accurately known, everyone is clueless, and no one can argue intelligently no matter how “scientific” they claim to be. Even more important than ECS is the damage function. What is it? We haven’t a clue. She’s much more comfortable with giving one side only, e.g., her Congressional testimony. Even there in Congress, the more pointed questions came from the Democrats which allow a one-sided answer, but with many Republicans’ questions all she has to do is say yes, unless she wants to add some background on her thinking, which would include the opposite viewpoint. In some ways, softball friendly-side questions are more challenging if you want to be a scientist in your answer. I do wish that Judith would take time to school the conservative talk show hosts.. I agree with you completely on the issue of why guests appear on talk shows. And please note I had nothing negative to say about what Dr. Curry said in those interviews. My comments were directed to her dismissive comments about those two hosts in particular. Not to beat this to death (OK, too late), but I commented on her referring to Levin and Santelli as “clueless.on climate change.” I asked for examples, and described a history Dr. Curry has had of being dismissive of conservatives. When some other denizens reacted and tried to answer my question, I responded, but none ever posted a quote supporting her comment. When Dr. Curry responded, which I appreciate, she wrote that it was her feeling that the hosts were not prepared, but she also did not post any quotes from the interviews in support of her comment. Nor has she herself denied her history of making such comments in the past. Her latest response is that she has googled Mark Levin climate change, and did not find anything very impressive. Which is fine, but is not a quote showing he is ‘clueless’ on the issue of climate change. And I suspect Dr. Curry in thinking in terms of scientific arguments about “climate change”, a truly non-descriptive term so that may be some of the source of the problem. But this is way too much ado about nothing. I said what I had to say, many responded, and none has answered my initial question. It is possible to disagree, even on a blog. The ‘climate change debate’ has been around since conservatives found out what the actual policy agenda was, and who was behind the ‘science’. Were it not for conservatives, Copenhagen would have enshrined, in the west, the progressive decarbonization agenda. It is nice to have lukewarmers and ‘moderates’ of all kinds on our side now, but they are late to the party. And I just think that those who are gaining more prominence than ever as a result of conservatives giving them a platform for their ideas, ought to consider leaving their condescension behind. I had these arguments at Keith Kloor’s blog back when it was interesting, and he finally asked me to stop commenting there, in two emails – not on the blog, because I kept asking him for examples of the “racism” he all too frequently claimed was common in the comments of prominent conservatives. He got more than a little irritated when I kept pointing out that he wasn’t posting examples as I requested, but only the opinions of those who agreed with him that conservatives are racist. In my opinion, Dr. Curry was just repeating another meme about how conservatives in general are clueless, without knowing the history of the conservative commenters (I think Santelli is more libertarian, but I am not sure). I appreciate her responding to my comments, and actually looking into the views of some conservative talk hosts. I doubt that many other bloggers would put in such an effort. All that (way too much) being said, I responded to your comment because you are always so gracious in your comments to me. I also want to dispute the claims that I am somehow attacking Dr. Curry by disagreeing with her. But I think the topic is well done. And unless someone says something really outrageous, I am as well on this subject. Yes, PA. I said science issue. You then bring up ECS, which is a science issue. I have to wonder if you know what ECS is, but you can make the argument that ECS hasn’t been measured. You can also argue that we haven’t accurately measured average global temperature and a lot of other things. You are talking science issues there, PA. Not very intelligently or effectively, but that’s what you are going on about. Maybe you think you are commenting on cooking? sports? the price of potatoes? 1. A good estimate of the atmospheric CO2 trend until the year 2100 (which has little if anything to do with emissions). 2. An accurate measurement of the TCR and ECS to +/- 10%. The IPCC RCP8.5 numbers of 935 PPM in 2100 (940 at years end) and 1961.5774 PPM in the out years (from RCP85_MIDYEAR_CONCENTRATIONS.xls) can most charitably be characterized as a delusional fantasy. If the recent 0.2W/22 PPM study is any indication the IPCC median estimate is off by a factor of at least 3, an IPCC estimate that has changed little in almost 30 years. WHAT HAVE THESE PEOPLE BEEN DOING FOR ALMOST 30 YEARS??? SITTING ON THEIR HANDS??? Without these two pieces of information we are in the analogous position of arguing about the “damage” from something without knowing how big it is or how fast it is going. That may be what scientists are interested in, but it’s of no use whatsoever for policy analysis. 1. When will the next abrupt climate change begin? 2. what direct will the change be (to warmer or cooler)? 3. How long will the change continue? 5. What will be the max, min and average rate of change and how long with the max rates of change last. Who has those? No one has a clue and there seems to be virtually no work being done on it. Peter, it would be nice to know all those things on your list. However, if one believes that there is a significant chance of the increase in CO2 causing an increase in temperature of say 3C by say 2100, it is probably a good idea to think about considering to mitigate that. That 3C would be added to whatever happened in the natural variability department. Which I think is numbers 1-5 on your list. Let’s say for the sake of discussion that we estimate that natural variability is likely to be in the neighborhood of a range that is limited by 1C rise in temperature, and 1C decrease. So, if it is the coolest outcome we probably don’t have to worry. If n.v. makes it 1C warmer then the total is 4C. Maybe we should worry. The problem is that we don’t and are not likely to know how to usefully predict n.v., in the foreseeable future. If you believe otherwise, please tell us about it. As some very clever commenter has observed, the scientists have been working on this a long time and they have not figured this crap out. It’s a nasty, knotty, stinky, sticky, wicked problem. So do we go with the trite and trivial , CO2 is necessary for life, and go on about our business unperturbed? Or do we consider the possibility that the 97% Chicken Little consensus goons could be right, in spite of themselves? Well, you are wandering into Dr. Curry territory. Simple fact is we don’t know how the climate works now (hence the stadium wave and some other concepts). If we don’t know how it is supposed to work we can’t tell if we have broken it. Dr. Curry seems to be addressing the problem areas and we need more of this. A subtlety that doesn’t get mentioned much, is that if the models are currently wrong because of natural cycles – they were wrong in the 90s. If the models don’t reproduce natural cycles – to train them to reproduce the 90s they had to misparameterize the models. Correctly parameterized models should understate the 1990s warming. Until science better understands how climate is supposed to work, and how it is changing (why the “water vapor feedback” for CO2 never emerged among other things) I would image it is hard to identify tipping points. But a “real scientist” would do a better job of addressing that. You should thank Judith for protecting your tender sensibilities, garrie. Nobody said that. You are attacking her by accusing her of a litany of things and refusing to provide evidence that substantiate your accusations. With the exception of the word “demeaning”, which is your erroneous characterization of what Judith said about Levin being clueless on climate science, which he is. Jimmy gave you examples to illustrate, but you poo-pooed the Levin faux pas by dressing it up as common sense. Really. And you insist that Judith owes you quotes. You already got them from jimmy. Mark Levin is a very smart guy and if he took the time to inform himself on climate science he would realize that up to now, he has been clueless. I am copying this, Judith, in case you delete it. If you do, I would appreciate knowing what parts are allegedly offensive and I will remove them. I thought you said that you were going to defend yourself from spurious attacks launched by these anonymous blog characters. And this anonymous blog character only gots initials to go with his ignorance. Peter, it would be nice to know all those things on your list. If we don’t know the answers to those questions we can’t make rational policy decisions. I have no confidence that we have any idea whether CO2 emissions are doing more harm than good. For that reason, I oppose any policy that does not have clear economic advantages, irrespective of any CAGW alarmist’s claims about some intangible benefit like ‘climate damages avoided’ many generations from now. The more of these weak arguments I see trying to justify policies that are not rational, the more strongly convinced I am there is no valid case for any of the proposed UN orchestrated policies. I think you nailed it Jim. It could have been much more productive for the host to take advantage of the guests expert insight by asking informed questions. My feeling is that both Dem and Rep congresspeople and talk show hosts are mostly clueless on CAGW compared to you and I. Most would have no idea what those initials stand for. Gary, I agree with a lot (not all) the conservative hosts views but except for Limbaugh they are clueless. I was clueless until several months ago after reading a WSJ article by Dr. Curry in October 2014. I think Levin and others do not know how weak the warmers evidence is. I didn’t. I would suggest to Dr. Curry to ask the host to watch these two very good youtube video interviews, one of Joanne Nova and her husband, David Evans, the former Australian minister in charge of their carbon accounting, both warmer converts to skeptics. They powerful and well composed. Peter, google “decisions under uncertainty”. I have been making those kinds of decisions since I was a little toddler. Many life and death decisions. Investment decisions. Who to kick to the curb and who to marry. Very often, with little or nothing to go on. It’s not the case that we know nothing. We know that CO2 is increasing in the atmosphere. We know it’s a GHG. We know that we are burning a lot of fossil fuels and the increase in CO2 is less than the CO2 that we are emitting. We know about radiative physics. Even the skeptical climate scientists figure that some warming will occur. They generally estimate it will be on the low end of IPCC guesses. Do you reject their low end estimates, as not knowing? What if they are wrong and the consensus crowd is right? The low end estimates seem plausible to me, but I know that I am influenced by wishful thinking. I will give you an example. Allen Greenspan warned about “irrational exuberance”, during the tech stock bubble. I was making millions and millions and was greedy for more. I knew several tech titans and they assured me all was well. We had federal and state budget surpluses that I figured would allow fiscal stimulus to cushion any downturn. Allen didn’t worry me. Wishful thinking and hubris. Bubble bursts, as it always does. I learned an expensive lesson that I have not forgotten. I don’t know everything. A lot of smart people say we should worry about AGW. I don’t believe they are all charlatans. I am listening. If they are right I hope they can convince me and the general public, before it is too late. They are not doing a very good job of it. If you haven’t spent some time on Lubos’ blog, you should. Peter, google “decisions under uncertainty”. I have been making those kinds of decisions since I was a little toddler. That simply demonstrates you don’t have any understanding of policy analysis, policy development or what information is needed for rational analysis involving $ trillions. Don, your first sentence is sufficient to show me there is no point you and I discussion this further. Sorry for incorrect spelling of your name. I don’t care how you spell my name Peter, I was just using your mistakes as a literary device. Didn’t notice your comment re. spelling as my eyes were watering by the time I got to the end of the previous comment. What you don’t get Peter is that I am not suggesting that somebody spend a trillion dollars, on a whim. I am telling you that some serious consideration should be given to the possibility that the alarmists have stumbled onto the truth. Their story is at least somewhat plausible. Google plausible. Or continue to know nothing. Don Monfort: What you don’t get Peter is that I am not suggesting that somebody spend a trillion dollars, on a whim. I am telling you that some serious consideration should be given to the possibility that the alarmists have stumbled onto the truth. Would you give some serious consideration to the possibility that the modern coolists (e.g. Abdussamatov) have stumbled onto the truth? If “stumbling” is your characterization of the methodology that has lead to alarmism over global warming, then you ought to. In fact, scientists of many specialties and and a rainbow of political beliefs have produced a substantial body of knowledge that, collectively, supports the claims that: (a) future cooling can not be ruled out; (b) warming due to CO2, if it occurs at all, will occur slowly; (c) oscillations between cool and warm, wet and dry, will continue to occur; (d) following b, mitigation of CO2, if it is any good at all, will have small effects in the distant future; (e) the warming, increase in rainfall, and increase in CO2 since 1880 have mostly been beneficial to humans, agriculture, net primary productivity of savannahs and forests; (f) all quantitative estimates have large uncertainties; (g) quantitatively, all of the changes since 1880 are small compared to natural variability. Lets suppose, someone comes up to you in 2000 and says “We have a problem, we don’t know bad it is, except from bad models and guessing, we don’t know when it is going to happen, except for bad models and guessing, but if we don’t spend trillions to stop burning fossil fuels immediately it will be to late.”. A normal person tells them to buzz off until they know something solid. The precautionary principle is you don’t waste good money on someone’s hypothetical disaster scenario. The IPCC range for ECS isn’t substantially different than a guess by a committee on anthropogenic global warming convened in 1979. No change in 35 years. The climate expert’s version is that since we don’t have good information we should act immediately. The people who would take this kind of policy advice (act immediately on bad/incomplete information) generally have a close business relationship with Nigerian Internet scammers as a client. Further, let’s assume the guy from 2000 shows up at your doorstep in 2015, again says we have to act immediately to stop impending disaster, despite it being 15 years past the absolute drop dead deadline, despite spending almost $100 billion on research since 1979, with no better information than he had in 1979 or 2000. You would tell him to “go entertain yourself” until he has done his homework and has better answers and a well bounded ECS derived from empirical measurement. If we stop all mitigation spending, except for the normal spending for adaption to other sources when fossil fuels become uneconomical, the onus is on the climate community to give us better answers. They will be the ones with the task tension. in response to your excellent “misparameterization” comment, it is logically true that if “natural variation” took over and displaced AGW after the ’90s, or at any point in time, then it is potentially and actually always dominant. If it can “choose” to intervene at random point ‘A’, unpredictably, then it can do so at any point. Diane Cardwell reports in the NYT that many utilities are trying desperately to stem the rise of solar power, either by reducing incentives, adding steep fees or effectively pushing home solar companies out of the market. The economic threat has electric companies on edge. Over all, demand for electricity is softening while home solar is rapidly spreading across the country. There are now about 600,000 installed systems, and the number is expected to reach 3.3 million by 2020, according to the Solar Energy Industries Association. In Hawaii, the current battle began in 2013, when Hawaiian Electric started barring installations of residential solar systems in certain areas. It was an abrupt move — a panicked one, critics say — made after the utility became alarmed by the technical and financial challenges of all those homes suddenly making their own electricity. “Hawaii is a postcard from the future,” says Adam Browning, executive director of Vote Solar, a policy and advocacy group based in California. In an interview with Berliner Zeitung on Oct. 17, Stephan Köhler, head of Germany’s energy agency DENA said harnessing the sun’s energy could overload the country’s electricity grid. Solar power, like wind power, is intermittent; it spikes on clear days around noon when the sun is high in the sky. But in Germany, demand for electricity is low around mid-day and high in the evenings (when people wake up, or come home from work, and turn on electrical appliances). That discrepancy, Köhler warns, could trigger blackouts. That hasn’t been a problem thus far because surges in solar power are accommodated by switching off conventional power station generators. But Köhler warns that if solar continues to be built at its current rate, eventually it will exceed demand and overwhelm the system. If we are partially successful at stemming global warming then do you suppose we can hope that the self-replicating machines will be only semi-intelligent and somewhat misbehaved? Not that any of these things aren’t problems, but that they have anything to do with carbon dioxide or global warming. Read up on the Sundarbans delta/estuary after reading the link. Had not known about this unique World Heritage area. Largest contiguous mangrove ‘forest’ in the world. Bengal tiger refuge. Spotted deer. Thanks for calling our attention to it, Judith. Climate change is hardly the main issue there. Rapidly growing India/ Bangladesh population has meant serious deforestation of the swampy freshwater interior for rice production, which means less sediment trapping and delta growth, plus growing salt water intrusion. Same problem, different cause, as Louisiana where channelization of the Mississippi mouth for shipping causes loss via erosion of the surrounding buffering bayou that is no longer sediment replenished by the annual spring floods. That bayou loss (which would have ‘loved’ nourishment from the runoff in the Mississippi, is also the proximate cause of the growing Gulf caused by those same nutrients.. All Anthropogenic, but not climate. And, these Sandurban delta sediments are subsiding via compaction at up to 5mm per year. Some outer islands have already disappeared below the waves. Blaming population, deforestation plus accompanying sedimentation loss, and natural subsidence problems on climate change is just a bid for a ‘fair share’ of the demanded $100 billion/ year Green Climate Fund reparations to be ‘decided’ in Paris at COP21. Looks more like a case of deceiving extortion than CAGW. Yep. Allowing siltation, preserving/extending buffer zones etc in major deltas could be big conservation initiatives in coming years. I’ve read that the Dutch have been helping in Bangladesh with their expertise and euros to take things in a new direction. There will be huge costs and downsides, but the benefits could be much greater. Let’s hope more aid dollars and “climate” funds find their way to sane conservation efforts which are free of green fetishism. And the Dutch, instead of preaching against coal while being a global hub for Russian fossil fuels, can promote something beneficial while keeping a perfectly straight face. Why? The Chinese Infrastructure bank will operate WITHOUT the agenda-isms of the World Bank and the IMF. Consequently, less-developed countries will finally have a source of funding their development projects denied by the World Bank and the IMF which insisted on forcing these countries to adopt climate change requirements to obtain loans (These were counter productive). I saw it first hand 14 years ago with an LNG project in Angola. It is my personal view that this bank has basically undercut the UN goals of climate treaties and climate change in a 21st century world. In short it has made Kyoto, James Hansen, Al Gore, IPCC, John Holdren, Barack Obama so “yesterday” in AGW. In short, the Chinese have told the developing world that the AGW movement and associated funding filters are over and they can get funding for their projects. Welcome to the 21st century, folks. Well, the Chinese are about 5-9 IQ points smarter the US and the Europeans so you are going to see more of this. I agree. I think think President Obama and the CAGW movement have done enormous damage to the world. It’s permanent damage. I expect it is increasing the rate of decline of the influence of the developed world. Small (300 MW or less), modular nuclear power plants are unsafe and more costly to build and operate than the large-scale units of 1200 MW or greater. I fully appreciate what the costs are now, under current regulatory regimes. However, you seem to have missed the main point of the submission. Do you have any constructive suggestions about how to improve the submission to make it clearer? William Gail appears off the rails. For the first time in human history, our actions have substantially changed Earth in its entirety: not just one nation or region, not just for a few decades, but all of Earth, forever. We now wield the physical capacity to irreversibly alter nature, along with our own society, on global scales. Global-scale reach is beneficial to the extent that it enables humanity’s advance, but its side effects portend deep new challenges. It is not hard to envision high-risk global issues that could follow global warming: rapidly proliferating infectious diseases with no antidote, self-replicating intelligent machines gone awry, genetic engineering glitches that ripple through our complex ecosystem, cascading species loss and much more. Sounds like the exhortations of Ted Kazinski. I rate this 4 Pinocchios, a sterling accomplishment in just one sentence. Once dwelt in that annihilated place? 2) “Earth in its entirety?” It’s hard to see what lasting, or in fact, any effect at all Global Warming might have on the Earth’s core, its mantle, virtually all of its crust or even the deep ocean. Once again I perceive an ego-centric POV as well as sloppy hyperbolic alarmist writing. 3) “have substantially changed” Does the uncertain AGW part of a SLR of 8 inches, a GMT increase of a degree, some receding glaciers, and decreasing Arctic ice cover amount to a substantial change already having occurred? Apparently Hyperbole is the twin brother of Hysteria. Can some ones help me out. I’m having less and less understanding of what harms global warming is supposed to cause. I see continual ambiguous intimation of all ilk of bad things, but nothing mentioned seems to stand up to observation or scrutiny. What are ‘you people’ so worried about??????? A communique was released in with regard to the phasing out of fossil fuel subsidies,and was endorsed by France and the US. Freeman Dyson on good reads,and the theological overtones of climatology. WUWT posted a link to this NYT article ascribing the new Asian Infrastructure Investment Bank to the developing worlds desires to get around US interference with energy projects. What’s interesting about the link to the “Environmentalism is Fascism” site is that its proprietor appears NOT to identify as a conservative/Republican but rather merely cites their research to support his/her own views. In fact, he/she is quite critical of the conservative “counter-movement” to environmentalism for accusing environmentalists of being “leftists” when he/she sees them instead as being controlled by a group of rich elitist landowners (and crony capitalists in the pollution-control and alt-energy industries). As was to be expected, Congressional hearings are more about political posturing rather than being a directed effort of objective information gathering. Naturally, there was the perfunctory public posturing of pretending to appear “fair and balanced”. But the unmistakable overall flavor was really one of there-we-g0-again legalistic tribunes where selected legal briefs are presented on behalf of well-known staked-out positions by convenient plaintiffs who get to argue the virtues of their special points of view on their favorite issues regarding global warming and global climate change. What went missing in this Congressional climate forum was any kind of real balancing testimony from experts in the field who have spent decades to analyze this important topic of global climate change. Regrettably, there was no real discussion as to what we actually do know about the global warming problem, and why we know it. But, looking on the brighter side, perhaps there may have been a small modicum of progress having been made in that the likes of Senator James Inhofe (R, Oklahoma) and Congressman Dana Rohrabacher (R, California) were not out there lambasting global warming and climate change as being the greatest hoax ever perpetrated on humanity. It appears that perhaps at this point in time, making such blatant denials of reality could be perceived as being unnecessarily clueless and ignorant. But then there is also the contrary example of courageous conviction, and understanding of the global warming reality, exhibited by former Congressman Bob Inglis (R, South Carolina), who paid the price for being politically incorrect. One can only hope that at some point, pragmatic sanity will eventually prevail. Even some of the staunchest of the global warming doubters have now grudgingly come around to acknowledge that CO2 does indeed absorb thermal radiation (but they want to claim that the absorption is small, that CO2 is saturated, and that water vapor actually absorbs more strongly); that while there might have been some increase in global temperature (it all has been mostly due to natural variability, and as such, it has been beneficial); and that while humans might have contributed to the rise in atmospheric CO2 (it has not been significant, and besides, the plants have benefitted from more CO2). While there was nothing that was specifically erroneous in these Congressional Hearing presentations, it was the usual problem of half-truths, misdirection, and non-sequiturs being used to paint a picture that is not an accurate description of where we stand in our understanding of the current climate situation. Part of the problem may also be attributable to the flexible nature of some basic definitions. What exactly is meant by this common term “global warming”? Literally, the term “global warming” would signify that the global-mean temperature is rising, and if the global-mean temperature were to be decreasing, the situation would then become “global cooling”. But this frequently used term has also acquired a more technical meaning as it is being used in climate science. As the key cause and principal component of global warming, it is the rise in atmospheric CO2 and other greenhouse gases that act to increase the strength of the terrestrial greenhouse effect, and induce more water vapor in the atmosphere as a feedback effect. This inevitably leads to an increase in global surface temperature. This is really what the term “global warming” represents. But there are other factors that also affect the global temperature. These can be caused by changes in solar irradiance, volcanic aerosols, and the natural variability of the ocean. Changes in solar irradiance and volcanic aerosols are typically known accurately enough. It is the variability of the ocean that is the principal source of uncertainly, such as a strong negative branch of the PDO cycle that can keep the global temperature from rising while atmospheric CO2 continues to increase unabated. It is important to remember that the present-day changes affecting the global climate consist of two basic components: (1) the ongoing global warming component fueled by increasing atmospheric CO2, and (2) the natural variability of the climate system that consists of random-looking fluctuations about a slowly evolving zero reference point of the climate system. It would be a misdirection to suggest that global warming has just somehow stalled simply because there has been only a little rise in global surface temperature since the prominent peak in 1998. There was no comparable “pause” in the rate of atmospheric CO2 increase during this time period. Instead, the global energy imbalance of the Earth increased as the heat energy that would have been warming the ground surface was being diverted toward heating the ocean. This puts more unrealized global warming into the “pipeline”, from which it will be emerging as the PDO cycle shifts toward its positive phase. The natural variability of the climate system also makes it difficult to infer climate sensitivity to the radiative forcing by atmospheric CO2. Reliable estimates of the equilibrium climate sensitivity (equivalent to about 3 K for doubled CO2) are obtained from the geological record and from climate model calculations. The transient climate sensitivity is by definition a moving target since it depends on the rate of change of heat transport into the ocean (which itself is a changing factor), and estimating the transient climate sensitivity from observational data is particularly difficult (and uncertain), because it is necessary to know all contributing forcings in order to disentangle the feedback contributions from the total climate system response. While the CO2 forcing may be known accurately, it is big uncertainty as to the “virtual” forcings due to the natural variability of the ocean that are the most difficult to determine. Thus, estimates of the transient climate sensitivity (whether high, or low), will continue to remain highly uncertain. In view of the above, the suggestion that climate models are running “too hot” compared to observations is disingenuous. Climate models may well run “cold” while simulating El Nino events, and run “hot” while simulating the global temperature during a strong negative PDO. Both climate models and the real world exhibit a form of unforced natural variability. And in both cases, this natural variability is quasi-chaotic, with no real way to coordinate the phasing of this variability. Any short-term comparisons between climate model results and observations need to keep this in mind. To sidestep this problem, the time period for comparisons must be long enough for the natural variability contributions to average out. Granted, the definition of “dangerous” climate change is ambiguous. And there is probably no real way to quantify just what “dangerous” actually represents. Perhaps the example of the Titanic may help. At what point did the situation on the Titanic become dangerous? There was no perceived danger when the Titanic left Southampton for New York. Most of the passengers were still dry and alive some two hours after hitting the iceberg. Did the danger begin when the iceberg was spotted, but there was not enough time to avoid the collision? Or was the danger already brewing when Captain Smith ignored reports of icebergs and continued full steam ahead? There might be some relevant parallels to draw. Global-mean winds, global-mean temperatures, and global-mean precipitation, compared between a doubled CO2 climate and the current climate would not appear to be consequentially different. But it is the extreme weather events that cause the damage. Whether humans get blamed, or not blamed, neither adds nor detracts from the problem. Global warming puts more heat, water vapor, and latent energy into the atmosphere. And that is the fuel that makes the extreme weather events more extreme. So, there actually is a real relationship to be had between global warming (human induced) and a growing danger of more severe weather extremes. A better studied quantification of this relationship would certainly be very useful. It would seem more appropriate to assign “wickedness” to problems that are more specifically related to witches. The climate problem, while clearly complex and complicated, is not incomprehensible. Current climate models do a very credible job in simulating current climate variability and seasonal changes. Present-day weather models make credible weather forecasts – and there is a close relationship. Most of the cutting edge current climate modeling research is aimed at understanding the physics of ocean circulation and the natural variability of the climate system that this generates. While this may be the principal source of uncertainty in predicting regional climate change and weather extreme events, this uncertainty in modeling the climate system’s natural variability is clearly separate and unrelated to the radiative energy balance physics that characterize the global warming problem. The appropriate uncertainty that exists in one area of climate modeling doe not automatically translate to all other components of the climate system. Besides, the persistent uncertainties regarding the natural variability of the climate system are not the real problem that we face. The real problem is the continued increase in atmospheric CO2 that is causing the ongoing global warming. And, the basic facts and physics for understanding this aspect of global warming are all well established and well understood. There always seem to be temptations to minimize the consequences of the global warming problem, or the cost-effectiveness of proposed efforts taken or suggested to counteract the global warming problem. That is just what Steven Koonin attempted to do in a previous post, nor does it appear to be different in this Congressional hearing. Typically, the economic costs of taking action to address the global warming problem are always cited as being unnecessarily excessive. This was true of the proposed expenditure of hundreds of millions of dollars to upgrade the levees and shoreline in New Orleans prior to Katrina, and in New York prior to Sandy. Had this money actually been spent to make New York and New Orleans more hurricane-proof, we might never have known that hundreds of billions worth of hurricane damage might have been averted. The economic cost of combating global warming is likely to be many hundreds of billions of dollars. But has anybody tried to calculate how many trillions of dollars it would cost to relocate Miami, New York, Washington DC, and New Orleans to higher ground? Surely, there are bound to be many other economic costs to tally up, brought on by the inaction to counteract the impending consequences that global warming is sure to bring. Clearly, decisions will need to be made, and they will need to be made sooner rather than later. Is there anybody in Congress who is capable of making the hard decisions? It is actually important to first fully understand the problem before deciding to act, or in justifying the decision not to act. It won’t do to keep making the same assertions as if they were incontrovertible when Prof. Curry (and Nic Lewis and others) are specifically making arguments against those assertions. It is either question-begging or foreign-tourist failure (speaking louder and slower but still in the wrong language after the natives don’t understand you the first time). Do the models indeed accurately capture natural variability when left to run unforced? If today’s lack of warming as CO2 increased is attributable to temporary natural variability, why isn’t much of the run-up to 1998 attributable to natural variability as well? And if in fact natural variability is responsible for the recent pause, wouldn’t we currently be in a world of freezing-cold hurt absent human emissions? Also it probably isn’t a great idea to say that if the oceans are absorbing more heat lately then that heat is contributing to “warming in the pipeline”–I believe that most “mainstream” analysis says that that’s not true, since the heat diffuses to create a tiny temperature increase across a vast volume of water. It’s also probably not a great idea to claim that more energy in the climate system implies more extreme weather events, since enhanced polar warming reduces temperature gradients across the surface and it is plausible that this could reduce extreme weather events. Even someone just tracking this debate from the outside can see these holes in the exposition. Cannot those inside the debate? The above, by the way, is Andy Lacis. Thanks, Dr. Lacis, for once again providing your clear perspective. Nothing there that I would disagree with. Regarding dangers of climate change, I think we can take a cue from Hansen’s Perceptions of Climate Change paper (PNAS, 2012). In it it is noted that taking a baseline such as 1951-1980, summer average temperatures have already shifted by nearly a degree in most NH populated areas which is a standard deviation. Tail of the baseline distribution, 3-sigma, summers were the French heatwave of 2003, the Texas drought of 2011 and Russia-on-fire 2010 episodes, meaning these would have been nearly impossibly hot for the baseline period. Under continuing emission growth scenarios, it is very possible that the temperature rise by 2100 will be 4 sigma relative to that baseline, meaning that a 1-sigma cool summer then will be the same average temperature as a 3-sigma hot summer now. Just a sobering perspective on the scale of the temperature shift and changing probabilities of a given temperature from being nearly impossibly hot now to being cooler than average in the future. This appears to reflect a misunderstanding of meteorology. Extreme thunderstorms derive energy from winds aloft ( jet stream ) not simply humidity. Jet streams are determined by temperature gradient. And temperature gradient is determined by the geometry of earth and its orbit around the sun – things increased CO2 doesn’t change. If high humidity was sufficient to cause severe thunderstorms, intense tornadoes would be present around the tropics. Instead, they occur mostly in the US and mostly in the Great Plains and mostly in the Spring when jet stream winds are present, and not in the ‘Dog Days’ of summer when humidities are even higher. And oh, yes, strong tornadoes actually exhibit a decline with recent decades of warming. Are they related? Who knows, but they do NOT reflect an increase in ‘extreme weather’ of severe thunderstorms. “extreme weather events” is usually left undefined, as it is here, which makes things more nebulous ( and like a monster movie, inaudible dialog makes the movie scarier ). So let’s define specifically some extreme weather in addition to severe thunderstorms. Drought – the most important factor wrt drought is precipitation. Indeed the current California drought, the recent Texas Drought, the Dust Bowl, all encountered less precipitation. Demonstrably for the recent droughts during which we have radiosonde data, there was less precipitation during droughts simply because there were fewer storm tracks across the drought region. This has nothing to do with global or even local temperature. The paleo record is painted with recurrent ‘mega-droughts’ through out colder and warmer periods. Atmospheric circulation has numerous quasi-stable states which are all valid solutions to the governing equations. Indeed, if there were only one state for the waves of the atmosphere, those under the ridges would never receive precipitation, those downstream from the troughs would receive constant floods. Sometimes these variations persist, but this is entirely a function of variable wave solutions and not global temperature. Now, droughts are marked by reduced soil moisture, which means a reduced heat capacity so when droughts occur in summer, they also include higher temperatures. But it is incorrect to apply the corollary that higher temperatures induce drought. Floods – increased flooding WOULD appear actually not just plausible, but likely in a globally warming world. Precipitable water increases with temperature on the seasonal cycle, so given the same number of precipitation events, high events would logically mean even greater precipitation amounts. However, let’s keep this in perspective. Such a transition ( from lower flood potential to higher flood potential ) occurs TO A MUCH GREATER extent from winter to summer every year. Further, floods are multi-factoral and humans have done many things, perhaps more significant things, such as increasing runoff from construction, levee building, and populating areas under sea level, which are great self inflicted flood risks. Further, increased availability of precipitation would appear to be beneficial for humans given global use. Increased precipitation would appear to necessarily coincide with increased flood risk. Blizzards – blizzards are similarly fluctuations in the general circulation – not a function of global average temperature. Heatwave – heatwaves are not well defined in the meteorological literature, but most would agree that they tend to occur as the result of air mass stagnation. Ironically, these stagnant air masses are the high pressure areas of the polar air masses that have surged to lower latitudes as part of the general circulation. Sometimes multiple polar air masses accumulate. If such events take place in winter when the reduced solar angles allow further cooling of the air mass. Sometimes this event takes place during summer when the higher solar angles allow heating under the fair skies of the subsident high pressure area. Heatwaves are dynamic events which are not related to CO2 or global average temperature. Extreme Cold – jet stream undulations which persist for much of a winter enable extreme cold period, such as the US Northeast in early 2015. Such events have taken place in the past and they occur now with our warmed world. Tropical Cyclones – the convection of thunderstorms within a tropical cyclone enable a tropical cyclone to persist by transferring converging mass from the lower levels to diverging mass aloft. To be sure, cyclones traversing from relatively cooler waters to relatively warmer waters tend to intensify. But it is in error to project this spatial relation to a temporal one of global warming. Indeed, if the models were correct, the tropical upper tropospheric ‘Hot Spot’ would tend to greatly increase stability in the tropics and squelch thunderstorms. The Hot Spot appears to be a model failure, and so, not a factor, but in any event, the ACE energy of tropical cyclones exhibits no correlation with recent decades warming and is near the low end of the range. As with all the phenomena, tropical cyclones are a function of the general circulation. Beyond the fact that many are formed from cross-equatorial synoptic systems, TCs are sheared and steered by mid-latitude circulation, which is again, not determined by CO2 or global average temperature. So, no, I’m not buying scare stories. TE, as I mentioned above. If you think of Gaussian bell curves of summer temperatures, by 2100 these are shifting by 4 standard deviations compared to 20th century climate. If you think about it, there will be almost no overlap between past and future summer mean temperatures when you shift a bell curve by four standard deviations. Even average future summers are beyond the hottest seen in the 20th century. To say that you are comfortable with this size of climate shift is misplaced optimism to say the least. Well, I wouldn’t be comfortable at 4 sigma. But I am comfortably confident that nothing like that is going to happen because of the slow rate of warming observed. TE, one standard deviation per 1/3 of a century is not much different from the rate so far. America’s GHG emissions cannot be reduced as quickly as President Obama says they need to be reduced unless the federal government puts a price on carbon and takes direct action to constrain the supply and availability of fossil fuels. As was demonstrated in 2009 and 2010, even a Congress controlled by liberal Democrats will not put a price on carbon and will not take direct action to constrain the supply and availability of fossil fuels. Here in America, all roads to achieving major GHG emission reductions pass through the Environmental Protection Agency, an agency of the Executive Branch. The Congress has already done its part in the effort to reduce America’s GHG emissions simply by passing the Clean Air Act and by funding the EPA to pursue its responsibilities under existing environmental law. Not another word of new legislation is needed from Congress to get the job done. Carbon dioxide in excessive atmospheric concentrations has been found by an EPA-managed, legally-valid environmental review process to represent a danger to human health and the environment. The EPA is mandated by existing law to be the lead agency of government in coordinating pollution abatement actions for reducing America’s GHG emissions. Any successful EPA-administered plan to enforce serious GHG emission reductions must be its own separate program managed according to its own separate criteria, and with its own uniquely-tailored regulatory enforcement framework. A realistic climate action plan must fairly distribute the economic burdens of the plan across all affected social, economic, and geographic groups. EPA-administered GHG reduction plans cannot be combined with other categories of pollutants without making those reduction plans so highly vulnerable to lawsuits as to make them legally unworkable. Here in America, the price of carbon can be raised without a legislated carbon tax through an integrated combination of two major anti-carbon measures unilaterally written and administered by the EPA. The first measure would be to directly constrain emissions of carbon pollution through a specified series of local, state, regional, and national emission limits. The second measure would be to impose a corresponding framework of stiff carbon pollution fines which is the functional equivalent of a legislated carbon tax. The only approach which has any possibility of success in reducing America’s GHG emissions is for President Obama and the Executive Branch to use the authorities they already have in their hands to constrain the supply and availability of carbon fuels and to raise their price, thus encouraging the widespread adoption of serious energy conservation measures and an eventual transition away from fossil energy resources. Liberal Democrats and the Progressive Left control the Executive Branch and the Environmental Protection Agency. It is their responsibility under current environmental law to take the lead in setting carbon emission reduction targets; to create a fair and equitable GHG emissions regulatory framework; and then to enforce that GHG regulatory framework so as to achieve substantial carbon emission reductions. The President’s existing climate action plan falls very much short in achieving his stated goal of a 28% reduction in GHG emissions by 2025. If the EPA were to publish a truly comprehensive and truly equitable set of GHG reduction regulations, nothing the Congress or the courts could do short of repealing the Clean Air Act could prevent the EPA from carrying out its assigned responsibilities under current law. If President Obama and his fellow liberal Democrats don’t start using the full legal authority of the EPA to its maximum possible utility in reducing America’s GHG emissions, then they can be rightly accused of playing politics with the issue of climate change. Congress controls EPA funding. Regardless of what EPA wants to do congress can simply refuse to fund it. Easy peasy. What hoax perpetrated on mankind was bigger in your opinion? The University of Western Australia and the Copenhagen Consensus Center today announced the establishment of a new policy research centre at the UWA Business School. The new centre will focus on applying an economic lens to proposals to achieve good for Australia, the region and the world, prioritising those initiatives which produce the most social value per dollar spent. . . .
Over the next four years, it will have three main projects. One will focus on the smartest development goals for the UN post-2015 agenda, which will be adopted in New York in September. This project involves several Nobel Laureates and more than 80 of the world’s and Australia’s top economists. The second project, the Australian Prosperity Consensus, will focus on determining which policies will help keep Australia prosperous in a generation’s time. It will generate economic evidence on efficiency across a wide range of Australia’s greatest challenges, including infrastructure, education, health, environment, governance, innovation and immigration. Its results will support a more informed national debate on Australia’s priorities. The third project will focus on setting global priorities for development aid and help DFAT and development agencies produce the most good for every development dollar spent. Participants from academics and NGOs, top politicians and philanthropists are encouraged to prioritise on questions such as: resources are limited and some solutions are smarter, so you need to take a stand; if you were making the decisions, what priority would you give the solutions presented to you? The center is slated to open in June or July, with a staff of three or four. Lomborg will serve as an adjunct professor. . . .The Australian Climate Consensus Center won’t be the first time that Australian prime minister Tony Abbott, whose record on climate change includes repealing Australia’s carbon tax and neglecting to include climate change on this year’s G20 agenda, has worked with Lomborg. In late March, Abbott invited Lomborg to address Australian diplomats and government staff during the Department of Foreign Affairs and Trade’s development innovation hub, an event aimed at finding better ways to provide aid to poor countries. Thank you this post. I missed all this. Also a massive thank you to Bjorn Lomborg and to Australia’s Prime Minister for all they have done and are continuing to do to lead us to make rational policy decisions. Judith will be horrified, I’m sure. And they say manufacturing is moving overseas where labor is cheap. Piffle! The Texas Legislature is currently considering a series of bills that would eliminate much of the important rules protecting not just air and water, but also public health and safety. Many of these laws have been in place for decades and are critical in a state where the energy industry and large polluting companies are a key part of our economy. Edit link: The Environmentalists’ civil war link is wrong. Discovered something interesting from a cool facebook page I haunt. When they share articles that are annoying they archive the article first using: https://archive.is/ and then post the link to the archived article. It has the benefit of not sending all your readers to the bogus article, which would give the offending magazine a bunch of ad revenue just for publishing something inane. Academics at the University of Western Australia will confront their leaders today with a ‘‘please explain’’ notice, in a forum to discuss a controversial new $4 million think-tank headed by climate contrarian Bjorn Lomborg. Tensions have risen at UWA since it was announced on April 2 that it would appoint Dr Lomborg, a trenchant critic of policies that tackle climate change, to head a new consensus centre in the university’s business school. Vice-chancellor Paul Johnson and dean of school Phil Dolan have described the centre as designed “to support a more informed national debate on Australia’s priorities”. The centre’s objectives include “a focus on the smartest development goals for the UN post-2015 agenda’’, which will be adopted in New York in September. A review of climate change targets will be part of that agenda. Raymond da Silva Rosa, president of UWA’s academic staff association, said the proposed centre had “drawn nationwide comment and generated divergent narratives about its genesis, its aims and its likely impact on UWA”. He said concerned staff had formally invited the two senior administrators to “hear the views and concerns” of campus staff, and both men had agreed to address the forum. Dr Lomborg, who is an adjunct professor at UWA, was recently appointed by Foreign Minister Julie Bishop to a reference group advising on Australian foreign aid programs. Greens Senator Rachel Siewert said she was ashamed of UWA “for ignoring science and facilitating the Abbott government’s undermining of any real action on climate change’’. He is going to cut Australia’s carbon emissions four times more than Labor did with its carbon tax at 1 per cent of the price per tonne of emissions cut under the carbon tax. He is now publicly confident Australia will “breeze past” its 2020 target of cutting emissions by 5 per cent on 2000 levels. This target is more ambitious than it looks. It involves a 13 per cent cut on 2005 levels and, given Australia’s rate of population growth — almost unique among developed nations — it’s a very respectable performance. Carbon taxes and emissions trading schemes are in disarray and of declining relevance around the world. They have failed to cut carbon emissions. They were going down more quickly in Australia before Labor’s carbon tax and will now go down more quickly over the next few years. The main driver of this is not the Coalition’s Direct Action policy. Carbon taxes have succeeded around the world in raising revenue; they have not done anything notable for the environment. The government is confident not only that it will exceed its 2020 emissions reduction targets, but also that it will be able to announce somewhat more ambitious targets for the next round of global negotiations. The government will announce these targets in July, before the Paris conference at the end of the year. The ABC, Fairfax and the climate change industry often present Australia as uniquely wicked in this policy area. Yet look at the facts. Australia did better than its target in the first Kyoto Protocol period. It will do better than its target in 2020. And it will announce a good target for the post-2020 period. In the meantime, China, India, Pakistan and many other nations continue to make massive investments in new coal-fired power stations. There may be legitimate criticism that not all of the projects of emissions reductions in Hunt’s scheme are guaranteed not to have gone ahead without the government money they will receive. But the reverse auction process is more robust, and transparent, than the rorted European ETS and its imitators. If Australia meets and exceeds its targets by 2020, and Bill Shorten offers to reimpose a carbon tax at the next election, this will be acutely dangerous for Labor.